Meat on a stick. Could you get anything that says man food more than that? Well, in the case of my man, yes, you can. Make that meat lamb, mix it together with bread crumbs and lots of indian spices and then put it on a stick - that is food heaven for him. 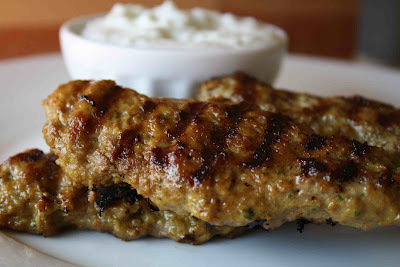 It's called lamb kofta to most others. It's another one of those dishes that he grew up on while spending time with his dad in England. We haven't been able to find good lamb kofta where we live so I finally bit the bullet and tried my hand at making it at home. I used traditional indian spices and a food processor helped make quick work of the recipe. This makes enough to form 12 skewers and serve 4 people. Since I'm usually only cooking for two, I hang on to the rest of the seasoned meat to make something else in the next day or two. Serve this with tzatiki and if you can't get ground lamb, you can follow these instructions for grinding it on your own (though most stores will do it for you if you ask). Cut the onion into chunks and place in a food processor with the garlic. Process until the onion is diced. Add all of the spices and process until combined. Add the egg, bread crumbs and ground lamb and process until a sticky paste is formed, scraping down the bowl as necessary. Form enough of the lamb mixture around each skewer to cover the top third of the skewer. Refrigerate the skewers for 20 minutes to help them hold their shape. Heat a grill pan or BBQ and cook the skewers for 5 - 6 minutes on each side until cooked through. Serve with tzatziki and enjoy! The start of this post had me giggling... you were describing my man perfectly!!! Will have to make this for him! My mom used to make lamb when we were little. This looks like a wonderful recipe. I will pass it on to her. Your lamb looks so savory and delicious. There's something fun about food on a stick. Sounds delish- and I'm not even a man. Whenever I ask my brother what he wants me to make him for his birthday (I'm thinking cake or cookies)he says meat lollipops. My mouth is watering...and I just ate! :D Looks super delicious and tasty. I remember getting kofta after a long night out at the pubs. I haven't had it in ages. In fact I haven't had lamb in ages. Looks delicious!